N.A.S.A. has measured near infrared light tissue penetration as deep as 9 inches, or 23cm. Yet, it is more complicated. Tissue penetration is related to light intensity. In the near infrared sauna, the energy is much more intense because it is concentrated in a smaller surface area and you have the option of targeting it on a specific area of your body. In far infrared saunas, especially those with carbon heaters, the total heat is spread out over a very large surface area. While some sauna makers promote this as a good thing, it has the unfortunate side effect of making the infrared much less concentrated at any given point on your skin. Less concentration equals less penetration. Near infrared light is an established anti-inflammatory agent. This is the main reason that near infrared light reduces pain. We have seen customers have incredible results with long standing pain management while using our saunas. In fact, there are dozens of hand-held therapy devices using near infrared for pain relief, and it is a common tool found in physical therapist offices. Far infrared wavelengths do not create an anti-inflammatory response. All electrical devices have some Electro-Magnetic Field and high levels are widely regarded as harmful. In an electric sauna, the heaters MUST have a reading of less than 2 milligauss to be safe. Near infrared saunas have a reading of 1 milligauss. Plus, when you use the sauna, you sit 2-3 ft away from the bulbs. At this distance, the EMF reading is effectively ZERO! This is an incredible benefit! Lab studies show that cells treated with near infrared light, and then exposed to toxic chemicals, are protected, while non light-treated cells die. Near infrared also protects against ischemic damage through increased nitric oxide. FAR INFRARED HAS NO SUCH PROTECTION! Given the daily assault of toxins we all face, near infrared sauna is a powerful protective tool. Another amazing benefit specific to near infrared light! Near infrared light enhances the cells’ production of nitric oxide. Nitric oxide is a signal molecule that regulates vasodilation. The result of near infrared stimulation is increased levels of nitric oxide lower blood pressure, reduced arterial plaque adhesions, and enhanced circulation. Also, an added benefit is increased nitric oxide confers anti-oxidant protection inside the cells. This is the real secret to near infrared light’s superiority. Our bodies have cellular receptors for near infrared. They’re called chromophores and they absorb specific wavelengths of near infrared light and use that energy for cellular action. This means we are biologically hardwired to NEED near infrared light for optimal health. When chromophores absorb near infrared light, they take that energy and use it to enhance the cell’s production of ATP. ATP is the way our bodies store chemical energy. The result of near infrared energy is more cell power to produce proteins and heal tissue. In study after study, near infrared light makes the body repair itself faster and more efficiently. All because of the chromophores and our natural need for near infrared. Of particular interest is the FACT that there are no such cell structures for far infrared energy. This is a benefit of the sauna itself. When you buy an infrared sauna, you plan to use it for life so that you can continually benefit from its healing function. That means you need to be able to maintain it over time, since all tools need maintenance. In an infrared sauna, the only thing that can really malfunction is the heater. If you own a far infrared sauna, not only will it be hard to tell if a heater breaks, but you will likely need to call a tech, or hire an electrician to perform repairs. Plus, you’d better hope your far infrared company is still in business. If not, you won’t be able to get the right parts and your sauna will become worthless in an instant. With near infrared, you can clearly see if a bulb burns out. And, changing them is something you can do yourself. Their lightbulbs are available online from any bulb distributor. You’ll always be able to maintain a near infrared sauna yourself, even if the sauna maker is no longer in business. This one comes down to a philosophy of healing. Is it better to extract a single compound and concentrate it or is it better to use healing energies the way nature provides them? 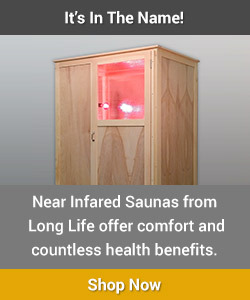 Far infrared saunas take the first approach and concentrate their infrared in a very narrow range around 7-10 microns. In fact, they promote their ability to deliver a very narrow spectrum as a good thing. This is the same line of thinking used to manufacture drugs. Take a single component from a naturally wide and diverse healing source, such as an herb, and concentrate it, leaving out all the other therapeutic and balanced compounds naturally present in the herb. It’s not that far infrared is bad, it’s just with far infrared saunas, thousands of additional healing wavelengths are simply ignored. Our Near Infrared Saunas are fundamentally different. We use a very wide spectrum that more resembles the wide spectrum we receive from the sun. It has a much broader action and is more natural. It is the same philosophy that chooses herbs over drugs, whole foods over synthetic vitamins and healthy, strong immune systems over flu vaccinations. When you use our sauna, you receive thousands of wavelengths covering a very, very broad range. Simple, natural and efficient!